With the official winter only a few days away, the weather is finally becoming a little cool. Only in the mornings though - the days are fine and sunny and by mid-morning even a light sweater quickly becomes too warm. 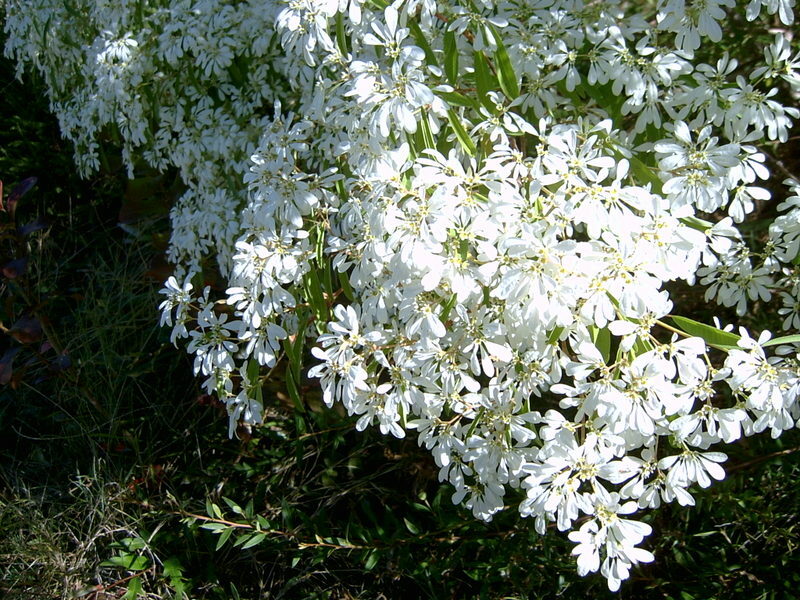 One of the delights of autumn is that the gardens in this area suddenly sport bushes that are covered in 'snow'. This plant growing beside my letter box is the delightful Snow Flake - Euphorbria leucocephala - not to be confused with the succulent plant from South Africa, also known as 'Snowflake', which is Euphorbia horrida. Our Snow Flake is related to the better known poinsettia and originates in South America. It is happier growing in warmer climes and not at all frost hardy. 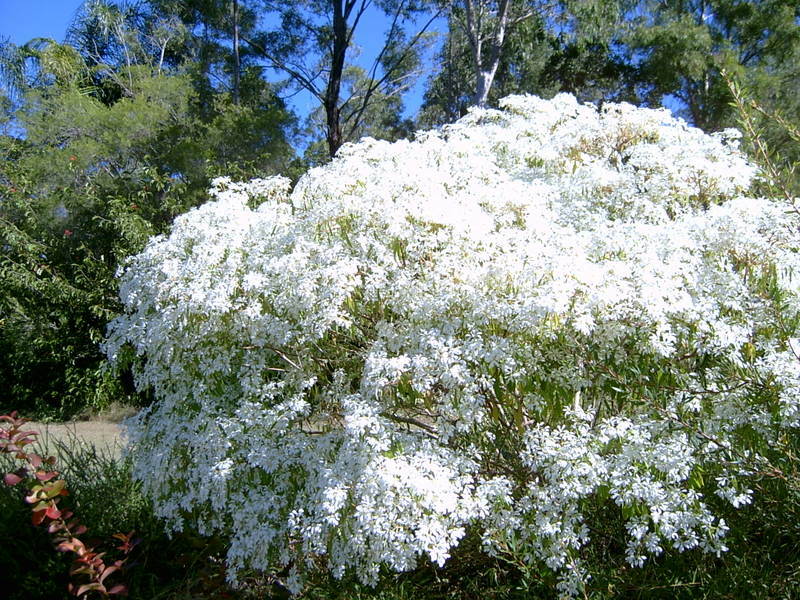 Elsewhere it is known as Snows of Kilimanjaro, Little Christmas Flower, Pascuita, or Snow Bush. 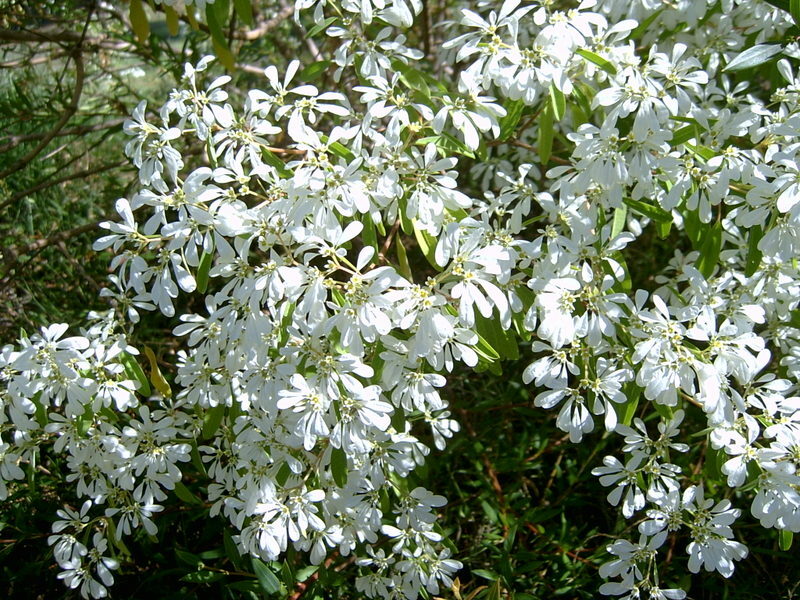 Apart from being breathtakingly beautiful, its other feature is the poisonous white sap in the stems. 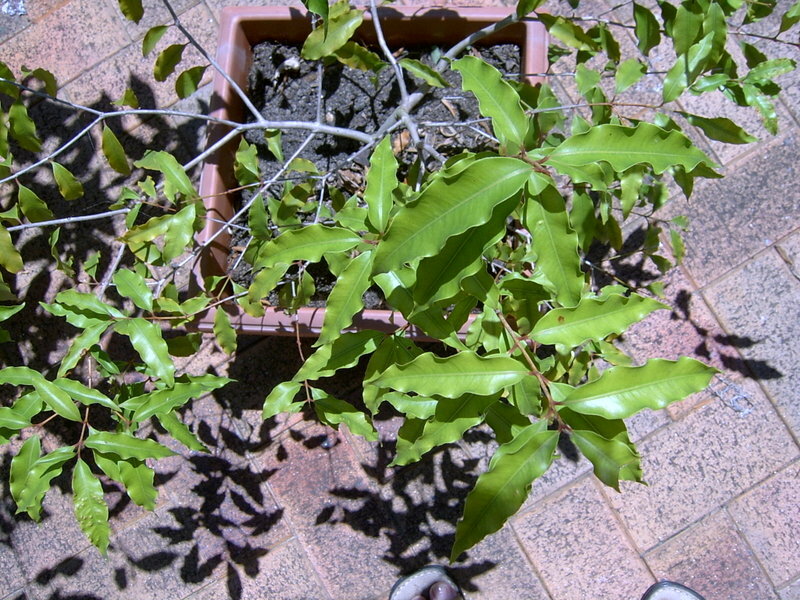 According to the Queensland Government's Poisons Information Centre, the plant's irritant sap can potentially cause skin blisters and rashes. And apparently if the sap or any part of the plant is ingested, symptoms may include vomiting and diarrhoea or a burning sensation in the mouth and throat. As the pleasure of this plant is in its showiness from a distance, and the 'flowers' do not lend themselves to picking for the house, the risk of growing it is not great. I like the Snow Flake because it is hardy and it self-seeds easily. And it brings the only kind of snow we are ever likely to see around here. From 5 - 7 cups a day, I've recently cut down my coffee intake to 2 - 3 cups a week. It's part of my effort to reduce the number of migraine headaches I suffer. Amazingly, it hasn't been so difficult - apparently I was not as addicted to caffeine as I had imagined. I now drink a lot of weak tea, turning to fragrant spicy blends and herbal teas that I brew for myself from the garden. Peppermint, tarragon, rosemary, lemon myrtle and aniseed myrtle are among my favourite ingredients - the two myrtles being easily grown Australian rainforest plants, with aromatic leaves that are fast becoming popular in 'bush tucker' products. Both trees are appealing garden specimens, producing masses of creamy white blossom in spring. I planted a Lemon Myrtle (Backhousia citriodora) not far from the bedroom window, but with a plan not to allow it to grow anywhere near its full height of 20 metres plus, as found in the wild. Hopefully, the regular harvesting of leaves for cold drinks and tea will keep it to a modest bush size. My Aniseed Myrtle (Backhousia anisata) grows in a pot handy to the back door where it is easy to slip out and pluck a couple of its stiff, crinkly leaves for a fresh cuppa. The flavour of this plant has been described as a 'sweeter, subtly aromatic, native Australian alternative to aniseed', and indeed, I can imagine it being far better appreciated by those who find the full anise flavour too powerful. Experimentation - blending either of the two myrtles with small quantities of fermented black or green tea - has produced some delightful brews. By adding other flavours - crushed cardamom seeds, grated ginger, a twist of mandarine rind, dried jasmine flowers or crushed rosella calyx - an infinite variety of appealing flavours can be created. Today I found a reference to a truly Australian gourmet creation called 'Yulu' (aromatic) tea. The ingredients are Lemon Myrtle, Aniseed Myrtle, Wild Rosella, Wild Lime and dried Davidson's Plum (the fruit from another native Australian forest tree). What an exotic sounding concoction! And all of those ingredients are already growing in my garden. I just need to wait a while for the plum and the lime trees to start bearing. If I'm still blogging when the time comes, I imagine I'll be reporting on my first cup of Yulu tea. Aged 86, she now lives in a nursing-home and is just a shadow of her old self. Dementia has robbed her of the ability to recall what she was doing earlier in the day, or to have a proper conversation, or to concentrate for more than a few minutes on a book or television. I moved out of home when I was 16 and so my strongest memories of my mother are from the days when she was full of energy and always had a dry remark or a witty comment to make. 'Waste not, want not' was her favourite saying, and we learnt that it was sinful to ever throw away anything that was still edible - or could be used again. Despite her frugal ways, she loved to go shopping - especially when she could pick up a bargain. 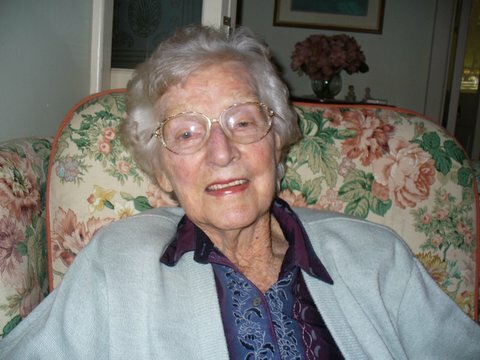 She also loved sport and played tennis and lawn bowls until a third hip replacement made it too risky. Having to relinquish her driver's licence in 2004 was a devastating event and she seemed to go downhill rapidly after that. I phoned Mum today to wish her a happy Mother's Day. Over all those years since I left home, our regular phone calls have been the means of maintaining our link. Today we had a superficial conversation over five minutes and then her interest waned. Already, in our heads, we are having to say goodbye to the mother we knew. Although it's not often watched, there is a television in our bedroom. We tend to use the radio in the mini hifi audio system much more, but I've always thought a TV could come in useful if either of us became bedridden for a period. 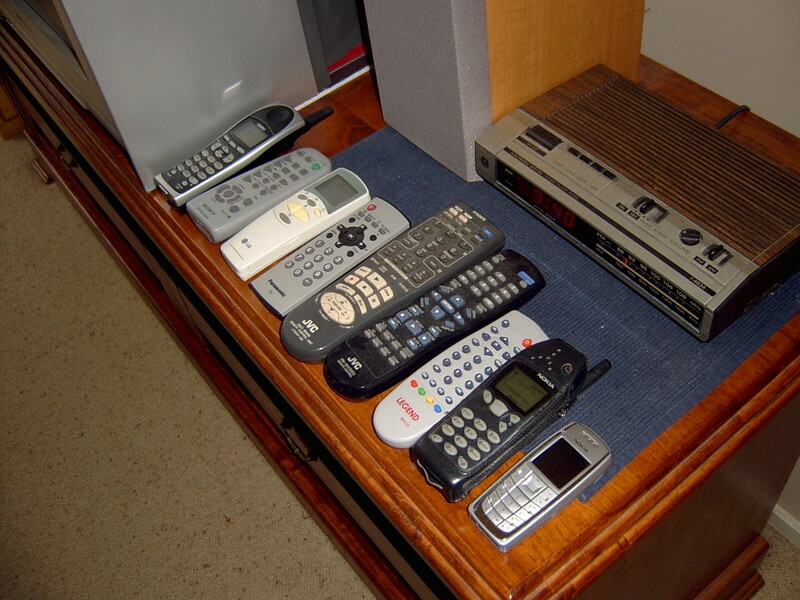 When we found ourselves with a spare VCR recorder and DVD player, we hooked those up as well. Then our son organised for us one of those little boxes so that we could receive digital TV. As a result, there is this remote corner in the bedroom. Also in the line-up are a couple of phone hand-pieces and the control unit for the air-conditioner. Just about eveything is remotely controlled these days. My old faithful clock-radio in the background has no remote control unit, but I would never give it up. Whenever I sneak open one eye during the night, its glowing red numerals always let me know precisely what time it is. BUT... I'd like a dollar for every time I've tried to change the radio volume with my telephone... or switch off the television with the aircon controls. As for using all of the buttons available on each of these gadgets ... I am the more knowledgeable one in the household, but the extent of that knowledge is pretty well limited to 'off', and 'on', or for volume / temperature variations, 'up' and 'down'. When an appliance accidentally becomes detuned, we just wait patiently for the aforesaid son to visit and put things right. Sadly, I was born a couple of decades too late to take advantage of a lot of this new technology. They don't seem to make any low-tech stuff any more, so we all end up buying equipment with features that will never be used. Our daughter, s-i-l and their dog have moved in with us until their new house becomes available. They hope this will be in a week or so, well before their baby arrives. 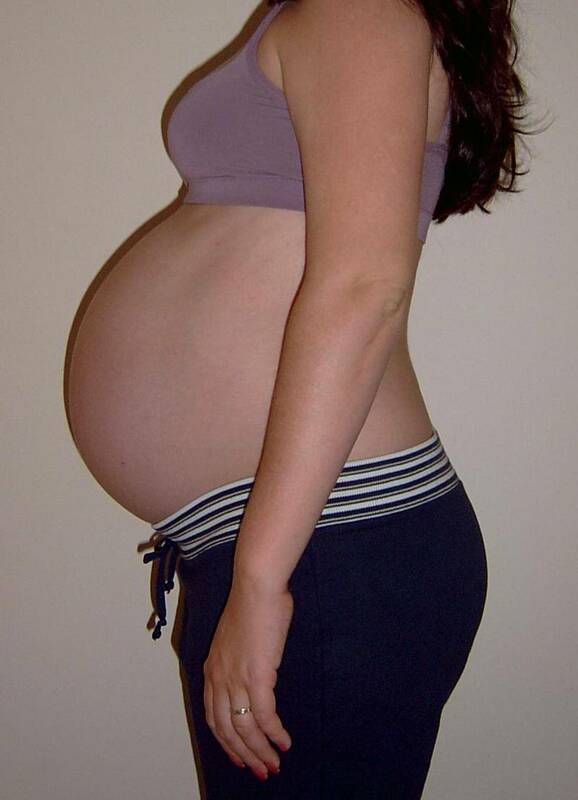 This is an update on my newest grandchild-to-be. His/her arrival is still 5 weeks away so we are expecting a good sized babe. In the meantime my daughter won't be practising any omphaloskepsis for a while.